Showers in the morning, then cloudy in the afternoon. High 56F. Winds N at 10 to 15 mph. Chance of rain 50%.. Some clouds early will give way to generally clear conditions overnight. Low around 35F. Winds NW at 5 to 10 mph. On Saturday March 16, 2019, our beloved Christopher Sean David passed from this life surrounded by his family at Kalispell Regional Hospital. He was born on Dec. 13, 2000, in Reno, Nevada, to Christine Mattingly Hesselman. On June 27, 2004, he and his mother married Charles David. The family moved to Trona, California, and then to Kalispell where, on July 25, 2007, his Daddy Charlie adopted him, making him “officially” Christopher David. A happier boy would have been hard to find. 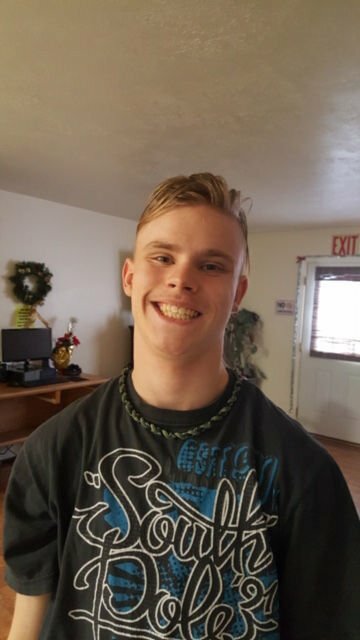 Christopher attended schools in Kalispell, Polson and Hamilton and will graduate June 2, 2019, from Hamilton High School. He participated in Christmas plays at Good Shepherd Lutheran Church, The Night Before Christmas with Port Polson Players and Special Olympics, earning several medals and awards in swimming, track and bowling. Video games were his favorite and he was good at them. At sixteen he became an organ donor. He would be so very proud to know that his donation has made lives better for possibly eighty people. Upon leaving the KRMC hospital, Christopher was afforded an Honor Walk through the halls. Doctors estimated that 300 hospital staff, friends and family lined the halls for the walk and that “not in 16 years had they seen such a turn out for an Honor Walk. We wish to thank all who helped Christopher through his life struggles with the positive influence, support and love they provided him. You are forever in our hearts and we are forever grateful for the support and happiness you’ve added to Christopher’s life. Christopher is survived by his parents, Charles and Christine David; his brothers, John and Danny; aunt, Johna Smith, all of Las Vegas, Nevada; grandparents, John and Sheri David, Polson; Carolyn and Glenn Waddell, Pat and Sue Mattingly, Betty Matlin; aunts and uncles, Gena Mattingly, Julie (Taylor) Reasonen, Patricia and Shane Parker, Donna and Gene Bonfoey, James and Linda Mattingly, Lewis Mathis, Victor Mathis, Gene Mathis; and many cousins. A Celebration of Life and potluck dinner is scheduled for June 8, 2019 at 2 p.m., at the Polson Elks Club, 512 Main St. Polson, MT 59860.